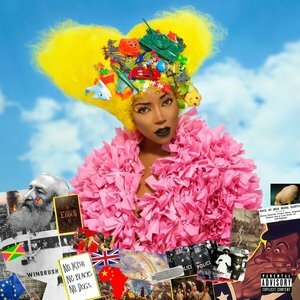 Ebony Bones performs a deep exploration of her complex sound, resulting in a magnificent collage of different genres and approaches producing a poignant, multifaceted work. The highly talented British artist Ebony Bones has displayed excellent work across various media. An actress, singer-songwriter, producer, and musician, she rose within the scene due to her unconventional musical style. By blending elements across the spectrum, from post-punk, art rock, and new wave, all the way to Afrobeat, classical, and electronic music, she produces complex works with immense scope. Her musical heritage is an amalgamation of these different worlds, with great musicians across genres aiding her in the beginning of her career. Rat Scabies (drummer of the Damned) played a pivotal role in Ebony Bones' early steps, while Cee Lo Green included her as an opening act for his live appearances. Her vocal delivery is also a result of this dichotomy, citing Lauryn Hill and Siouxsie Sioux as musicians she likes. When Ebony Bones emerged with Bones of My Bones, she produced a fairly straightforward offering. Leaning towards hip-hop territory with a distinct pop, melodic edge and an electronic music foundation, the album was a strong start to her career. But, in the years to come she started digging deeper, an excavation that eventually led to the excellent Behold, A Pale Horse. The perspective of Bones then changed, with the producer taking a left-field approach. Recorded in India, the record also made a turn towards world music, featuring mystical elements and a spiritual aesthetic. This quality is now further explored with Nephilim, Bones' new album, which sees her expand the experimental scope of far-ranging realms. Alongside the hip-hop, new wave aesthetics, we find an Afrofuturist progression, punk elements, tribal percussion, and experimental jazz alongside neoclassical renditions. The record begins with a bizarre meeting of two different worlds in "The Watchers", kicking things off with a horn section that points towards the New Orleans jazz scene but appearing with a pensive, ritualistic procession. It brilliantly leads to the neoclassical tone of the title track, which is easily one of the highlights of the record. Featuring the Beijing Philharmonic Orchestra, the subtle melodies of the track and Bones' ethereal vocal delivery produce a mesmerizing vision. At the same time, the electronic percussion and repetitive patterns produce a hazy weight, that displays an affluence for the late 1990s trip-hop aesthetics. From one transition to the next, the album constantly morphs through the constant spiritual motif. "Ghrelin Games" sees the hip-hop element come to the front, with a more bouncy and infectious tone, while Asian melodies evolve around an Afrobeat motif. The vocals again carry a big performance, with a spiritual element. With "Police & Thieves" Ebony Bones explores trap music, going deeper into a more mysterious and obscure hip-hop area, while the Bones Youth Choir offer a great contradiction to the trap-esque effects and beat with their childish voices. For its first half Nephilim displays a more serene and fragile manifestation. Even through the darker "Police & Thieves", the record arrives with an ethereal, mesmerizing aura. However, for the remainder of the album, Ebony Bones offers a diverse perspective. The jazz aesthetics first arrive in a more dominant fashion with the big band "Oh Leopold", delivering a recital of old-school jazz spirit. Similarly, the rendition of "Bones of My Bones" from Bones' debut record finds its carnivalesque element, with the Beijing Philharmonic Orchestra playing a supporting role and boosting the element of theatricality the track delivers. From that point on it is the world music element that takes over. "Kids of Coltan" takes the Afrobeat sound and leads the way in a more energetic and upbeat manner. Similar is the case with "This Used to Be a Lovely Country", which uses tribal percussion to set up another one of the highlights of Nephilim, "No Black in the Union Jack". The anthemic performance from Ebony Bones, and the repeating mantras pave the way through the upbeat progression, constructing a modern protest song. It is a case of progression and evolution, and Ebony Bones has achieved a big leap forward with Nephilim. Looking back at her albums it's clear that her work in Bones of My Bones and Behold, A Pale Horse, have been a preparation for this moment. Nephilim finds Bones at her best, with a vision that spreads wider, but also with a more focused demeanor.